Terbium is a silvery white rare earth metal found in cerite, gadolinite and monazite. 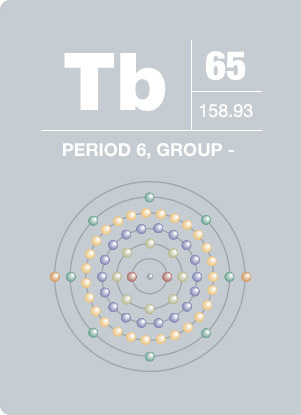 The element was discovered by Swedish chemist Gustav Mosander, who also discovered lanthanum and erbium. Soft enough to be cut with a knife, terbium melts at 1356 °C. Until the recent advent of ion exchange techniques, it has never been isolated in pure form. Sodium terbium borate is used as a laser material and emits coherent light at 0.546 μm. In fuel cells, terbium is often combined with zirconium oxide to stabilize crystals at elevated temperatures.